The cost of terrorism to the world was $52.9 billion in 2014, the highest since 2001, according to the new 2015 Global Terrorism Index. This chart is taken from Vision of Humanity’s index and is based on IEP calculations – these assess the direct (and some of the indirect) costs of terrorism, and is conservative in its approach. The chart shows the global economic costs of terrorism from 2000 to 2015, in billions of US dollars. 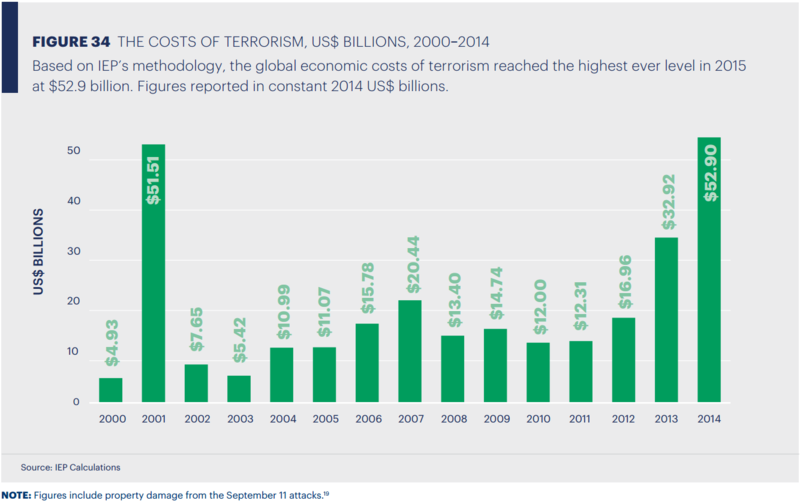 As highlighted in the chart, the cost of terrorism reached its highest point in 2014, surpassing the economic impact felt in 2001. This represents a tenfold increase on the figure in 2000, and a rise of $20 billion on the previous year. However, as a point of comparison, the losses from violent crime and homicide in 2014 reached $1.7 trillion. 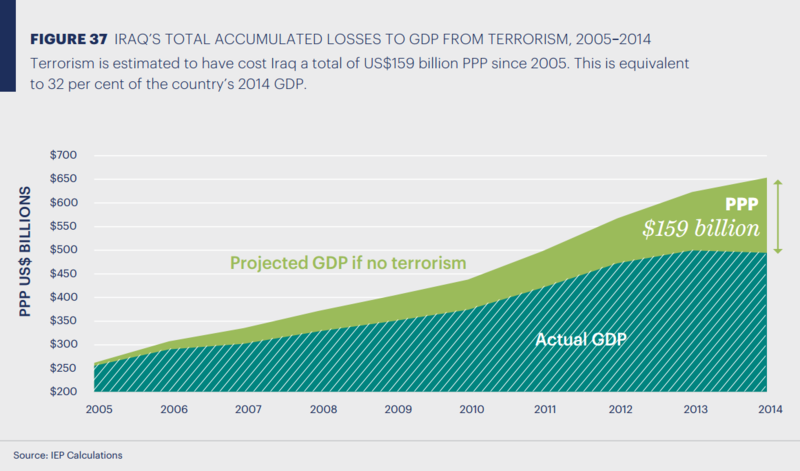 The following chart shows the impact on the economy of one country – Iraq – by estimating the cost of terrorism to the country’s GDP. Since 2005, it is estimated that terrorism has cost Iraq $159 billion in purchasing power parity. This represented 32% of the country’s GDP in 2014. In Nigeria, it is estimated that terrorism caused foreign direct investment flows to drop $6.1 billion in 2010 – a decline of nearly 30% on the previous year. Equally, around the world, the report highlights that the 10 countries most affected by terrorism saw decreased GDP growth rates of between 0.51 and 0.8%. However, as the report emphasizes, a number of factors influence the cost of terrorism to a country’s economy – the diverse nature of terrorism, the economic resilience of an economy and security levels all play a role – so the economic impact of terrorism is varied.